This weather is CRAZY, yo! I took Emma to Dr. McMeltme this morning and when we left it was raining and 41 degrees. Within 6 minutes the temperature dropped almost 10 degrees and it was practically a blizzard outside. 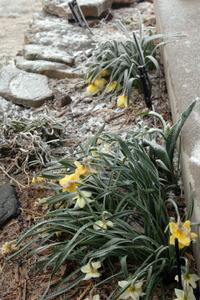 Did I mention that it's APRIL?! I had to drop her at school wearing John's hat and gloves, which were luckily in the van. That is to say that *I* was wearing the hat and gloves - it was a little chilly when I opened the van door and pushed her out into the blinding snow. Oh please - obviously I'm kidding! EMMA was wearing the hat and gloves. But I did push her. We are not morning people. 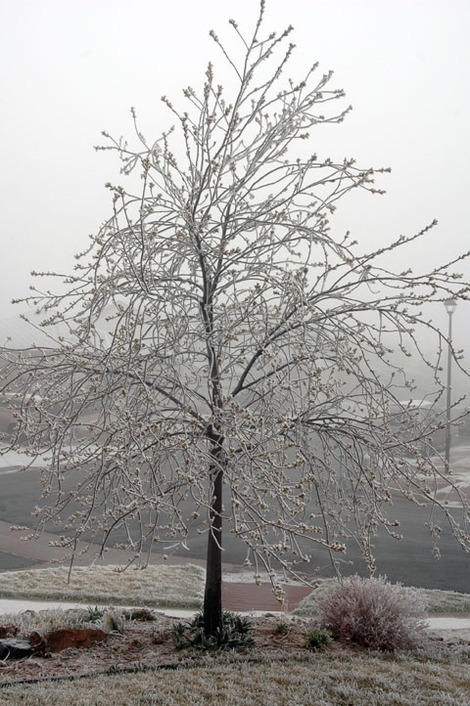 "Burniston" is derived from the Latin word "Burr" meaning "stay in bed, it's cold outside!" and "Istonia", meaning "irresponsible late-night TV-watching." So when I dragged myself out of bed this morning, already too late to accomplish the proper level of primping for Dr. McMeltme, I was not pleased to find Emma in a grump-funk. ME: (yawning) Emma, go get dressed and stop stomping and hmmphing. Nobody wants to hear it. Karl - do you want to hear a bunch of hmmphing from Emma this morning? Now at this point Emma had a choice. She really should have taken one look at my sleepy-yet-fiery eyes and zipped it, pronto. But, instead, she chose . . . poorly. EMMA: (folding her arms, stomping her feet, looking at me defiantly . . .) HMMPH!!! ME: Hey! That will be enough of that! Who do you think is in charge here? And here's a hint - it isn't YOU! EMMA: (with an innocence that was both wide-eyed and utterly false) Daddy? You know that scene from Nine to Five where Violet fantasizes about how she'd kill the boss by putting poison in his coffee while wearing a Snow White outfit and frolicking with cartoon woodland creatures? And then she skips down the hall in her ballet slippers and presents the poisoned coffee to the boss and he drinks it? And then his head starts spinning around and his eyes bulge out and steam comes out of his ears? Yeah, that pretty much describes me after Emma said that thing about John being in charge. Luckily, I'm an adult. I can rise above the petty goading of a third-grader and act with role-modelish maturity. ME: Well I guess Daddy can make your dinner from now on then!! Oooh, ZING! Did you see how I zinged her? High five!! EMMA: Well at least Daddy isn't MEAN to me when I'm feeling a little GRUMPY in the morning!! I can't believe I was totally out-zinged by an 8-year-old. I think in my shock I may have managed to mutter something about her tone and reminded her to be respectful around adults, but mostly I was reeling from the harsh realization that Emma is, in fact, Mini-Me. Yes, I have cloned myself. She shows every promise to be my protege for all things sarcastic. There were earlier signs, of course, but the true significance of her quickened wit didn't really sink in until this morning. It was like the balloon of my "Emma's so SWEET!" delusion floated up towards the popcorn ceiling and burst, sending little rubber shards of the doe-eyed darling floating casually to the floor while the air grew sticky with snark. No really, go ahead and re-read it. That's some dayum good almost-poetic prose, no? "The air grew sticky with snark" - pure jenius! I think we just have to face it - Emma has found her inner snark. May it serve her well! We bought our house from an avid gardener. She filled all the beds, front and back, with a variety of bulbs and perennials so that things were blooming every month from March - August. We never met her, though, because the sale was handled by her relocation company. Poor AG. She probably should have instructed the company to only sell to someone with a lick of gardening sense. Over the last three years the backyard beds have completely overwhelmed us. I've been able to keep up moderately well with the front beds, although there have been times when I've carefully weeded around a weed because I know next to zero about plants and, gosh darn it, some of those weeds are sort of pretty! My neighbor Becky is a great gardener and so is her mother, who visits occasionally and will innocently ask Becky things like "Does Karen know that those are weeds?" When I brought back tulip bulbs from Holland a couple of years ago I shared some with Becky. I knew from the flower shop that I was supposed to plant them in the fall, but forgot until early November and planted mine a couple of weeks later than Becky. Also, I didn't know that there was a specific depth they were supposed to be planted. I also had no clue where anything else was planted, so I just dug some holes and threw the bulbs in. So here it is Easter weekend. The daffodils have been blooming for a couple of weeks, the tulip stalks made their appearance, and I had little faith that they would bloom until a couple of days ago when I saw . 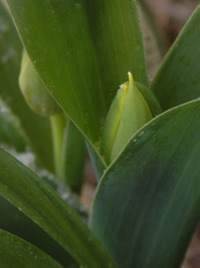 . . the startings of some bulbs!!! Makes you just want to don a pair of sandals and hide some eggs, no? But I think the tulips are going to make it. Let's hope! You know how people say "I'd rather have a root canal" to signify when they REALLY don't want to do something? They say it so flippantly, like "Shop the day after Thanksgiving? I'd rather have a root canal!" or "Do my taxes? I'd rather have a root canal!" Well, I'm here to tell you, after having an ACTUAL root canal this week . . . there's pretty much NOTHING that I wouldn't rather do instead. If, for example, I was captured by an evil despot and was forced to choose between having a root canal or eating a live baby squid . . . I'd have to say; "Pass the ketchup!" I am really looking forward to this trip! Thanks to all the stores who booked classes. I'm going to get a lovely driving tour of the entire greater Phoenix area! Yay! Happy Easter! Try not to get frostbite! Uh, yeah. That "I'll post pictures of three nifty classes tomorrow" thing was also part of the April Fool's joke. Yeah, yeah, that's the ticket. What I MEANT to say was "I'll post pictures of TWO nifty classes on TUESDAY"
Note to all the non-scrapbookers: this is pretty much an all-business post. The business of scrapbooking, so I totally understand if you want to bail. So here's what's been going on. I met Lance, the owner of Rusty Pickle, a couple of years ago in Holland and we discovered that we have similar teaching styles. (Only I don't make people bribe me with food to win door prizes. Honestly - what woman could pull that off? That guy's a hoot!) Lance is a hot commodity - stores all over the world want him to come teach, and I had the opportunity last fall to design a class for him. Now they're giving me opportunity to teach Rusty Pickle classes since Lance can't be everywhere at once. A third class choice is in the works and will also be a mini-album class with interactive features. So if you are in the Phoenix area and would like to take one of these classes, can you do me a solid and ask your local store owner to contact Rusty Pickle's rep, Kristan, about booking a class? I would oh-so-appreciate it! Oh, and don't be thrown off by my photo choices. I tend to use kid photos because I have a ready supply and because I'm too lazy to get photo releases from people. 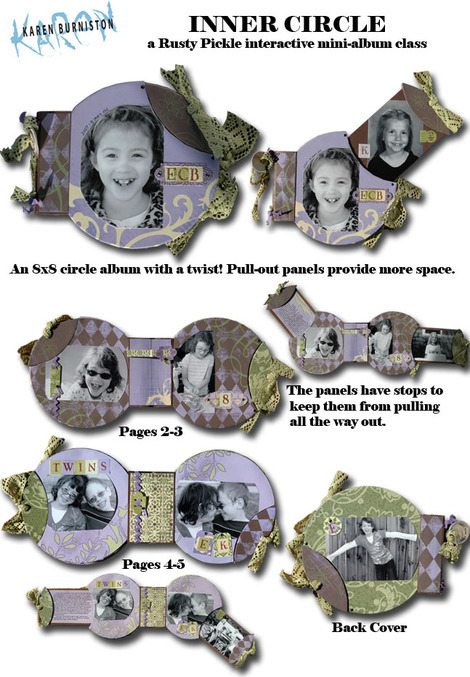 The Inner Circle album can be used for anything - think Mother's Day, romance, friendship, family, etc. I used it to compare my daughter at age 8 to me at age 8, so all the pull-tab photos are from 1978. How fitting that Emma and I have the exact same jack-o-lantern grin! Inner Circle would also make a unique gift album - maybe for a wedding or Mother's Day. And, as with all my classes, you'll get a detailed instruction sheet and extra templates, so you can always make the album again with different colors. 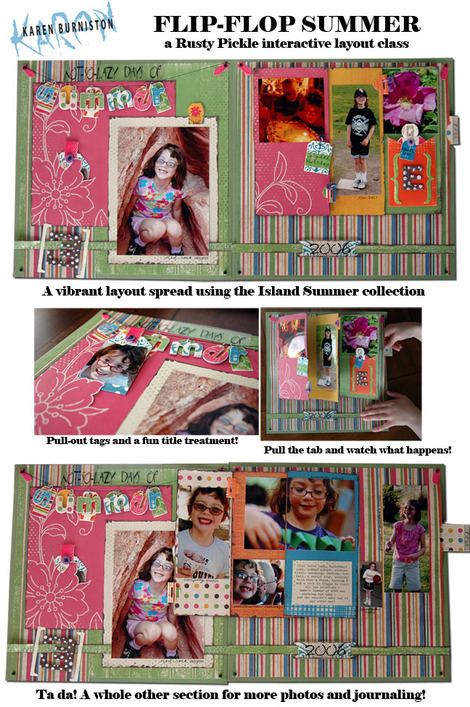 On Flip-Flop Summer, think anything summery, maybe a vacation, or, as Evelyn pointed out - you could make it an Easter layout. (Which works for the title because Easter has the same number of letters as Summer!) Oh, and with an easy page protector alteration, this layout operates fine inside an album. So that's what I've got so far. Working hard on Class #3 so I can post it. Oh, and I'm sorry for pulling that mean prank on you. Well . . . I'm mostly sorry. I'm partly very pleased with myself for pulling it off - did you see how well I used the "family comes first" and "life is chaotic" reasoning? Pathos, so good at the pathos! Heh. I think we've all seen this coming. My posts have been too infrequent and too unfunny. I fell victim to one of the classic blunders. The most famous is "Never get involved in a land war in Asia" but only slightly less well-known is this: never attempt to write a funny blog post when STRESS is on the line! And boy has life been stressful. Just a lot of lousy stuff. Suffice to say that it didn't stop with the cars. But I won't bore you with all the chaos of my life - you come here to escape and I haven't been up to the task. So it is with much regret that I must give up blogging. I won't say that I will be back because I just don't know if I will. Thanks for all the great comments and for sticking with me when the posts were rather "meh". I've made a lot of wonderful friends through this blog and it really pains me to give it up, but my family comes first. Bwaaaa haaaa haaa! I really had you going, didn't I? Which brings me to the REAL "with much regret" subject of this post: April Fool's Day. What IS this holiday? I remember as a kid that we loved it. One year we went barreling into our parent's bedroom and convinced my groggy dad that it was "for real snowing outside, for real!" This would be quite a rare occurrence in the rainy valley of Oregon, especially in April, but, as I mentioned - he was groggy. Now growing up in a small town like Junction City meant that you pretty much knew every kid in school, most of them since kindergarten, unless they happened to have transferred in. I can remember everyone still calling a kid "Jeff C." years after "Jeff A." had moved away. The real irony being that there were no other Jeff's to cause confusion. I believe it was third grade when I was invited, along with Aimee, to Mark Reader's birthday party. He was a kid that I had a little crush on, until he developed quite the potty mouth in 6th grade and the luster dulled. But in 3rd grade he was still the semi-center of my universe and Aimee and I were the ONLY two girls invited to the party. Did I mention that his birthday was April 1st? DAD: Well don't you look nice! Are you going somewhere? DAD: But Karen . . . that party was yesterday. ME: No sir! It's today! I can hardly wait! DAD: I really hate to break this to you, but your dates are all mixed up. His party was yesterday and we thought you didn't want to go. ME: (doubt creeping in) But I'm sure the invitation said Saturday . . .
DAD: No, it was on Friday. Terribly sorry, honey. I think the tears were welling up before Dad called out "April Fools!" and the relief was greater than the anger. But here it is, almost twenty years later, and I can still remember it like it was yesterday. The problem with April Fool's Day is that to really get someone going, you have to be, well, sort of mean! ME: How fitting that you backed in this time - at least I only slightly messed up your driver's side mirror - nothing like the carnage of the passenger one. And then I nonchalantly kept thumbing through the mail while the uncomfortable silence grew. I finally looked up and found him glaring at me. GLARING! It was the "Oh no you DIH-UN'T!" look. He just rolled his eyes. Didn't even crack a smile! Just then Karl came into the kitchen and put something in John's pocket. KARL: Here, Dad, have a nickel! KARL: April Fools! It's a fake nickel! JOHN: Awww. You got me! And then they laughed and laughed. What's this? What kind of lame prank was that? I decided to show them how it's done. ME: Oh, Karl, I'm so sorry. I hate to tell you this but . . . I ran over your bike with the van. It's pretty messed up - you might want to go look at it. KARL: That one wasn't very funny. He's right. It's very hard to hit that sweet spot of believable . . .but not cruel. The kids just rolled their eyes when I told them to pick between cat food or dog food for lunch because we were out of people food. They didn't even look up from their activity when I told them they were having Macaroni and Snails for lunch (for added protein). I did manage to fool Emma into thinking that there was residual shampoo in her hair, but she didn't even blink when I told her there was a blue patch in the back. She, by contrast, had me in the bathroom checking my teeth for "something gray" and pulled it off expertly. Her grandpa would be so proud! When John was unloading the dishwasher he asked where the food chopper was kept. "In the third drawer" I told him, and then, thinking fast "Uh, I mean the second drawer." He opened the second drawer and I called out "April Fools!" and the kids laughed so hard that John was forced to join in. So I think we'll stick with fake nickels, gray teeth and drawer misdirection, leaving the cruelest of the cruel for the cast of Punk'd, where every day is April Fools Day! If you will tune back in tomorrow, I will be able to show photos of some new classes. John was out of town for a week, and the combination of his absence, plus the kid's Spring Break, plus soccer starting and one of my teeth breaking, meant that I didn't have things done as early as I planned. But a dozen diet cokes, an entire bag of Tostito's with Lime chips, some new music for the iPod and four pounds of "I'm uninspired so why don't I snack?" weight have all done their job: three new interactive classes that are nothing short of nifty. (If I do say so myself.) No foolin'!